I never thought I would post a Burger King Bacon Gouda Muffin on my website. Why? I haven’t always been a fan of Burger King. When I saw their commercials for their Bacon Gouda Muffin, I thought to myself, this is definitely a breakfast that I would enjoy, and now you can too. This sandwich is incredibly good. The eggs are freshly scrambled, and then topped with crispy bacon, and smoked Gouda cheese. I honestly thought that this item would be served at a much higher end restaurant, but no, this one came from a fast food restaurant. I found smoked Gouda cheese in the grocery store in the deli where they the keep fancier cheeses. For this recipe I baked my bacon. I love to bake bacon because you get nice crispy and flat pieces to work with. You also save yourself a cleanup on the stovetop. So I present to you one a breakfast sandwich that is giving the breakfast taco a run for its money during my daily commute. Burger hit the mark with this savory bacon Gouda muffin. I highly recommend you go ahead and bake your bacon. Preheat your oven to 350 degrees. Cut bacon in half and place on a baking rack that is nested in a baking sheet. Bake bacon for about 20 minutes or until brown and crispy. You can cook this on the stove top as well. In a small bowl combine 2 eggs and 2 tablespoons of half and half. Whisk together well. Pour eggs over a hot griddle that two teaspoons of butter have been melted on. Cook eggs on medium-low heat until they are done. Do not disturb the eggs while cooking. When eggs are almost done cut the eggs in half and fold eggs into smaller portions. Toast muffin, and butter both sides. 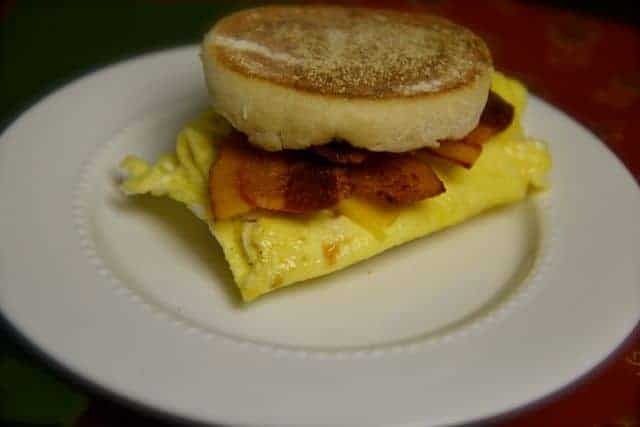 Assemble sandwich by placing the eggs on the bottom bun, then the cheese slices, and finally add the 4 pieces of cooked bacon. Top with the remaining muffin top. I’ve been craving this sandwich since I first taste it at BK and was hoping they would bring it back out!! I’m going to try and make an attempt to make it tomorrow! But I was looking for the garlic sauce! That’s what made the sandwich along with the GoudA cheese! I came to this recipe because the only reason why I loved this sandwich was the gouda, and the garlic sauce, Guess I’ll keep looking since you don’t mention the sauce. I work at BK, and we add a garlic butter sauce to the bottom half of the muffin. It’s delicious! Oh dear, I bet that makes the sandwich even more amazing.